A new way to help diabetics record and share critical health information. Over 17.9 million Americans have diabetes, and they all live with the painful, often thrice-daily process of using needles to check blood sugar. The process is clunky and uncomfortable — and dangerous due to potential errors. But a new iPhone-compatible glucometer hopes to change all that, by improving the blood collection process while providing an easy way to track data. The new iBGStar glucose meter by Sanofi-Aventis, which will be demonstrated for the first time in the U.S. this Friday at USC’s Body Computing conference, builds upon the existing diabetes-tracking technology WaveSense to simplify the collection and reporting of diabetes information. This new product can actually take blood samples using a device that plugs right into the iPhone. A small glucometer accurately reads blood sugar from a strip that a very small sample of blood is placed on — “a prick that can hardly be felt,” says Saxon, compared to the more painful stabs of conventional meters. And in fact, the technology used to measure the blood glucose, which doesn’t rely on the conventional electric sampling, actually improves on traditional meters. 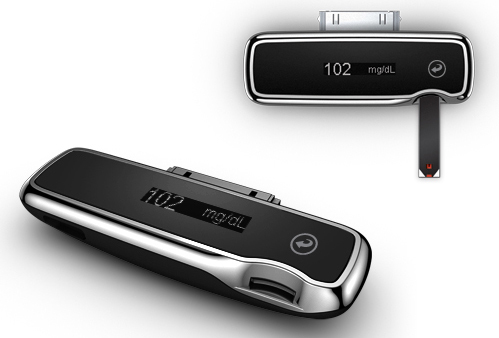 The design is smaller and more portable than most glucometers and even aesthetically matches the iPhone. A case can be fitted around the meter that wraps around the phone, keeping it extremely handy for users who are on the go. And like a text message from your body, a prompt can be programmed into the phone to serve as a reminder to check levels. Using the iPhone app (coming soon) in conjunction with the monitor also allows the meter to do many things it could not do alone. Namely, the app allows the user to input various behavioral or environmental changes — skipped a meal, exercised, recently injected insulin — and can track that information along with the blood sugar levels. 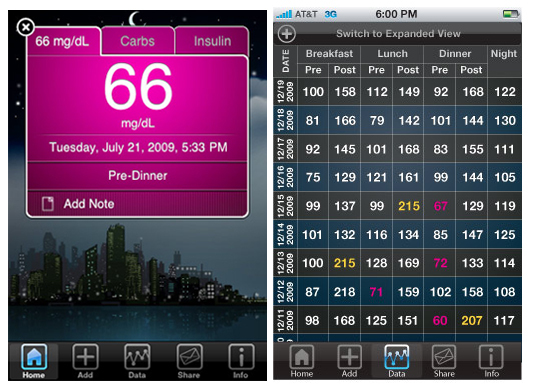 Some examples from the WaveSense diabetes tracking app, which powers the technology in this new glucometer, show how the information is plotted. The data stored in the application can be accessed on the phone or the computer, allowing the user to always have the information at hand for a health care provider. Most importantly, says Saxon, the data can be programmed to be shared, which is critical for medical personnel if someone needs assistance, but also for the parents of children with diabetics. Currently pricing is not available since the product must undergo FDA review. The official release is expected in early 2011.